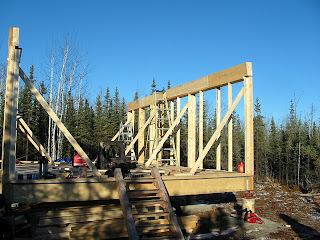 We finally got the beams built up and the walls all braced plumb, and Ken's tractor to start in the cold. So we now, officially have header beams! Yay! I was going to film the actual lift for you all; but I missed it. No seriously, I missed the whole thing! 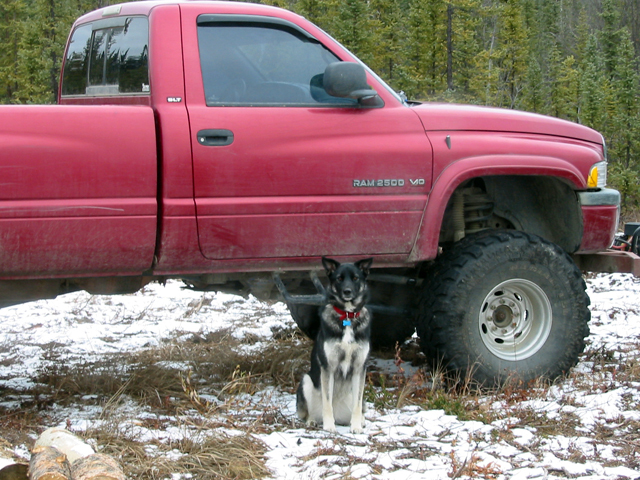 I'd been down at the site measuring, marking and templating while G-man was lighting a fire under Ken's tractor (yes, literally, diesels and Alaska winter don't play well together). Well, it was taking them awhile and my poor hands and feet were freezing, so I went back up to the tent to thaw out and get a cup of coffee. They showed up at the tent just after I got there, so I sent them down to the site while I made us all a pot of coffee. Figured it would take them a couple minutes to sort out logistics and move stuff around to get the tractor in and such. But when I got down to the site 15 minutes later - they were already nailing in the last of the anchor cleats!! I guess I should be thankful that everything was set up so well in advance that it all went quick and smooth... but it was such a huge milestone in the project, and I missed it :( No cool action shots of Ken lifting that big beam up onto the posts with backhoe and dropping it down neat as you please. From what they say, it only took a tiny bit of persuading to bang them flush on the posts and the walls didn't even budge an inch. It was nice to have Ken come take a look at what we've done and give his blessing as a professional carpenter/builder on the design though. Some people of the male persuasion in our household had some serious doubts about the integrity of his wife's structural engineering and design abilities :D But Ken confirmed that the design is actually a little over-engineered for what we're doing, post-framing being as light as it is, and that has put us all at ease. 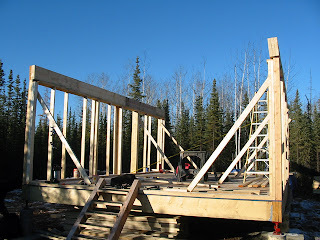 Once we get the joists hung, that'll plumb up the beams since they're only cleated in place right now. After the joists have tied everything together, we can take down the braces to frame the end walls and get started on the rafters. Woohoo - then it's time to sheath sheath sheath baby! Since Paul picked up our woodstove in Fairbanks for us yesterday, we'll be able to get her heated as soon as the sheathing is on and the flue is installed. 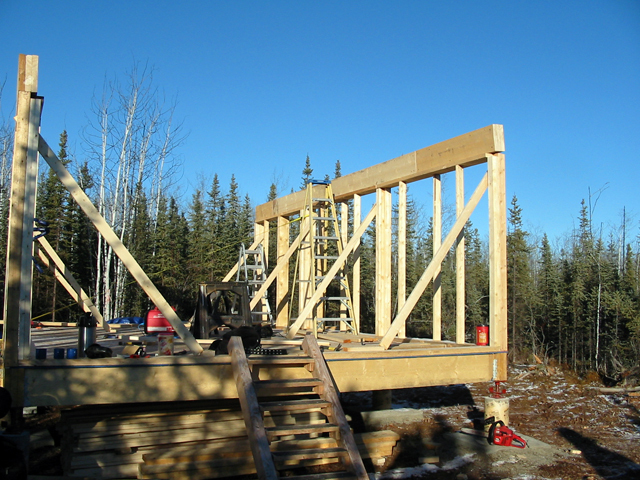 Ken's going to come back and help us with the last of the framing as he has time since it's really starting to get too cold to do much more carpentry this season... once you can't cut a board or drive a nail because your lumber is frozen solid, trying to keep going is self-defeating. But, we should be able to get her all buttoned up by the end of the month... which is perfect since our drop-dead moving date one way or the other was Halloween! "Would you guys hurry it up, geeeeeez!!" Ripley, our little task master, (im)patiently waiting by the truck for us to get ourselves in gear and get our butts back to building her house already! She doesn't care that it's only about 20F right now. Heartless!! I think it's cool that the headers went up so easy, but I'm sorry that you missed it! Would have been nice to have some pictures of all that, but maybe next time! Good luck with the rest! All is looking good! The tent is 16x20 (320 sq ft) and the cabin is 16x24 (384 sq ft). If we end up needing the tent, we'll likely abandon the rafters and just put the tent on the second floor and secure a tarp "lean-to" over the 4' section on the end. The cabin footprint is 64 more square feet on the first floor, pretty much taken up by staircase so no gain really. But the loft gives us an additional 300 sq ft of usable floor space. And, if you count that the walls down stairs are vertical for 7' instead of 4' like the tent, we get a whole lot more storage space on the wall rather than the floor. All-in-all, we'll be more than doubling our current usable floor space. It will be so nice to have some walking and breathing room again! Thanks as always for the great update, PC. I'm rooting for you.